Music is one of the methods to keep your mood fresh. The good beats make you dance while the bad beats which you don’t want to hear. Now the question arises here is from where these beats are made? The answer is simple there are different kinds of software through which you can make these beats. In fact, beat making is an art and you can find your career in this field. The DJ which are most popular these days and you have heard about the famous DJ’s such as Marshmellow. This article deals with the best beat making software for pc which you need to know if you want to make a career in this field. Why learn about the beat making software? In past years to use beats inside music requires an expert but nowadays different software are released which are easy to operable. The software is available on all the platforms such as Windows, Mac OS, and Linux. If you want to compose your own music then you need to learn about the beat making software. No need to rely on the experts and if you have pc then you can do compose music on your own. The popular DJ use this software to compose the music and mix them. If you have this software then there is no need to buy an instrument because it has plugins which contain all instruments present in it whether it is piano or drum. If you want to become a pro DJ then the beat making software is essential. Here is some best beat making software for pc which you need to know. The software is designed in such a way that it can for any platform whether it is on Mac or windows. It can work on a different version of windows such as 7, 8 and 10. In Mac, the operating system should be 10.11 or later. There should be 4 GB of free space on your hard disk to install the software. RAM should be 4GB or higher to run the software smoothly. This is another best beat making software for pc which is made for the Windows platform only. If you are using this software then you have to select a song or want to create your own song then this software will be useful. You can mix up to more than three songs or edit the song according to you. There are several features of this software which you should know. There are two upgradation to this pack one is the Plus and other is the Premium. In the Plus version, you have to pay $60 to access all the features. The premium version of the Magix music maker can be upgraded at the cost of $80. You can make music, Record music, mix music, and master music. Also, it can support all file format. These are the basic requirements to run the software if your pc is specifications are higher than the given requirements then it is well and good. The software works on Windows platform only. It supports all the versions of windows such as 7, 8 and 10. The hardware specifications to run the software is at least 2 GB or higher RAM is required. There should be around 700 MB of free space in your hard disk to install the software. Must have a graphics card of resolution 1280 x 720 or higher installed in your pc. 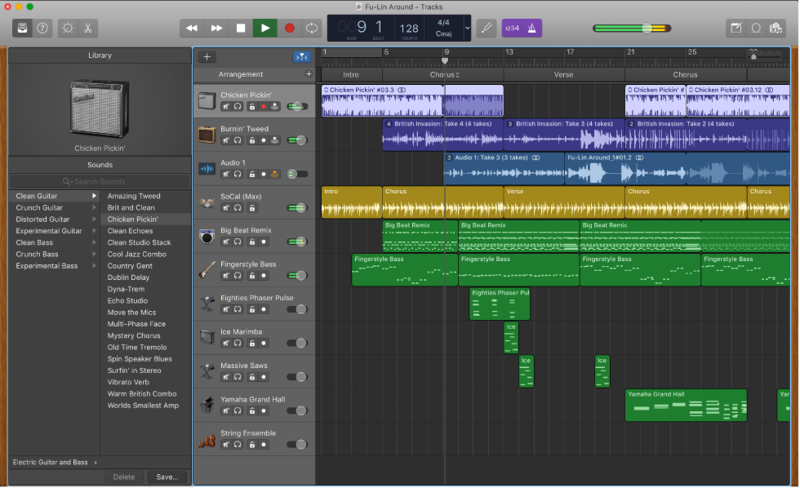 If you are Mac user then GarageBand is the best beat making software for you. You can connect your instrument like guitar or mic through or even play without the instrument. If you have an ios device then you can access the software and transfer the music from to your GarageBand playlist via icloud. You can share your mix up songs with family and friends also you can share your song on the internet. Also, you can export your hit songs to the iTunes library. The limited feature software is free of cost but if you upgrade to premium then it cost you some money. After that you will be able to avail all the features of the software. Also you can save your file in various formats as appoximately all the formats are redable by the software. The operating system version of your Mac should be 10.12 or higher. At least 1GB of free space to install the app. More than 30+ languages are installed in the software. System Requirements:-The Muskink lite is available for Windows platform only. If you want free version then you can go with the lite version or if you want some advance feature then you can go with the pro pack. The minimal system requirements to run the software are as follows. Works on all the versions of the windows such as the Windows 7, 8 and 10. Requires at least 1 GB of free Storage to install the software. Musescore is another tool to show your creativity in developing your own beats. This is a very powerful software in which you can edit the composed music or make your own music. In this software, you can sample, reverb, distortion, chorus, phasing, flanging the composed song. There are different plugins which are necessary to install so that you can compose unique beats. Most important thing is that the software is free of cost. You don’t have pay or upgrade to the pro kit use its features. Star composer uses this software to compose their beats. But one thing is that the features are limited in comparison to other software which is paid. Also, it can support multiple file format. The best part of this software is that it supports three platforms which are the Windows, Mac, and Linux. Since there are very few beats making software available for the Linux out which Musescore is one of these. Now the basic requirements to run the Musescore beat making software on your pc. The software is made to work on different versions of Windows such as Windows 7, 8, 10. To run the software on Mac your operating system should be 10.12 or higher. The resolution of your pc should be 1000 x 600 to run smoothly. 300 MB of your hard disk space is necessary to install Musescore tool. This software is similar to the drum station. If you are a beginner or a professional then HammerHead station suits you best. What HammerHead Rhythm can do? The Hammerhead can create tehno loops and record high quality. Like a drum set it contains 23 different drum patches with six different loops. The software is made for the window base. HammerHead Rhythm software consists of several features such as tempo, shuffle, feedback and distortion. You can use 35 samples at a time. This software is the oldest and the most reliable when it comes to usage. One of the best thing is that the software is free of cost. As you know the software can be used on the pc having windows operating system. The requirements are not very high since it is very old software. The pc having operating system version 95/98/NT. Not much space is required to install the software. To sum up, the above tools are the best beat making software for pc. These tools allow you to sample, reverb, distortion, chorus, phasing, flanging and much more. Create your own beats and share it with the world. Enhance your qualities and the tools shown above are enough to create your own unique music. Also, the software is less costly than buying an instrument. You can achieve all your dreams by becoming a DJ and mixer. These days DJ are more popular if you are thinking of your career in this field then these are the software you should know. A good DJ is one who makes people dance on his beats. Hopefully, you like this article on best beat making software for pc. If you like this article feel free to drop your comment.